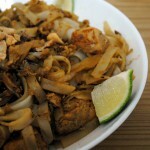 In New York comfort means ordering in Thai food. That was the worst part of living in the Bronx – no Thai delivery. We had to go down to 86th Street if we wanted curry puffs. I was so nervous about being deprived of Thai food that my friends Sam and Manissa cooked me a huge spicy Thai dinner for my going away party. It was the perfect send-off. And fortunately getting Asian ingredients in Be’er Sheva has not proven to be a challenge. Most supermarkets here carry a huge selection of soy sauce, fish sauce, rice noodles, sushi rice, and more. Bamboo steamers are available at every kitchen store. I was relieved. And after two weeks without Thai food, I had serious cravings. Although we rarely order Pad Thai when we go out (Evan and I are more pad see ew kind of people) I decided that’s what I would make. The Mega supermarket didn’t have fish sauce so instead I got a Pad Thai cooking and dipping sauce and decided to give it a shot. The brand is Healthy Boy but the first ingredient is sugar and the logo shows a pudgy child clutching a bottle of sauce. With the help of the sauce, my process was fairly simple. Soak the rice noodles in hot water for 30 minutes or so, then drain and toss with some oil or mirin to prevent from sticking. I cut chicken breast into bite size pieces and cooked in the Pad Thai sauce and mirin. The chicken absorbed the thick sauce and got nice and brown. I cracked two eggs in the pan and stirred vigorously to scramble and incorporate them into the dish. 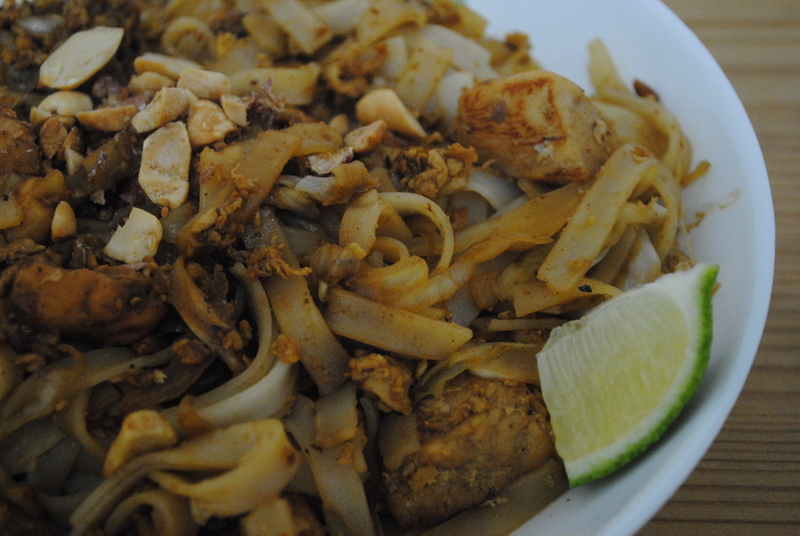 I added some chopped peanuts, then started tossing the noodles with the chicken and more Pad Thai sauce. 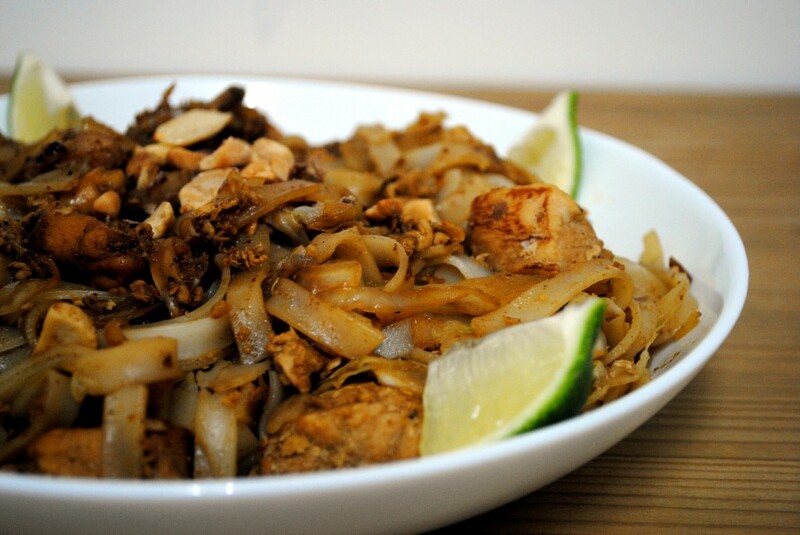 Serve the Pad Thai topped with more crushed peanuts and lime wedges. So I cheated. But you know what? It was really good. 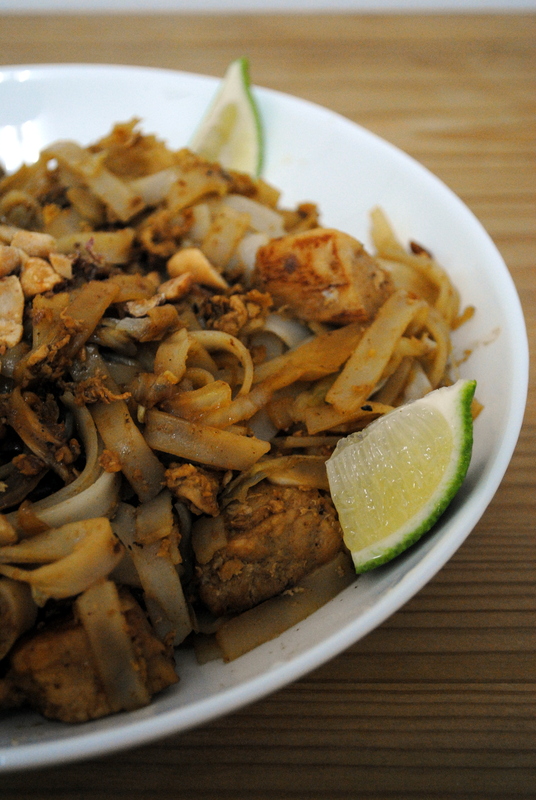 And certainly the closest thing to Pad Thai we’re going to get in Be’er Sheva. Forgot to mention in a comment I made elsewhere (Jew and the Carrot?) about the Asian food importer I buy from – they have fish sauce. 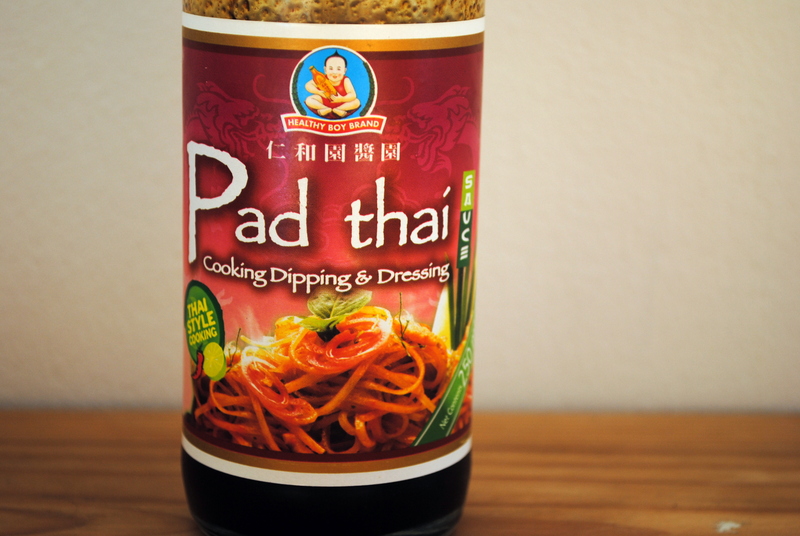 With that and some tamarind paste, you’ve got the basis for your own pad thai sauce. 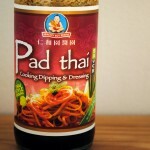 You can mix up a batch and it keeps pretty well, seriously reducing the overall time of making pad thai. Thanks Andy! This was one of my very first posts – I think I had lived here all of two weeks! My pantry is now stocked with fish sauce – I think I found it at Tiv Tam. I’ll have to try mixing it with tamarind! Yum. I know it’s been many years since your original post but is there any chance you remember the quantities you used?